Nassimbeni recently spent time at David Krut Workshop to produce a series of highly technical and conceptually challenging aquatint etchings. Nassimbeni harbours a fascination with South Africa’s troubled narrative of social change in relation to architectural and geographically specific development, or, in this case, the lack thereof. These works tune into the heightened sense of navigational politics attached to Hillbrow – from an architect’s perspective. They are an abstract rendering of a recent journey that Nassimbeni took through the area, which he traversed by foot. He documented buildings which were erected in the late twentieth century and appear today as a dilapidated shadow of their initial design. The artist worked with our team of experienced printers to design three large prints, individually titled Stair, Frame and Park. These etchings are part of a wider, ongoing project called Falling in…, in which Nassimbeni presents various attempts to orientate himself in Johannesburg –“freeing falling”, as it were, into its fraught but fascinating dynamics. The composition and sensibility of each print differs, but all three are structured as overlapping depictions of Hillbrow forty years ago and Hillbrow in 2016. In this way, the prints can be seen to cross-reference each other through subtle repetition of line. 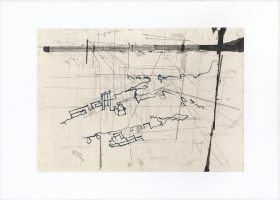 To reference Hillbrow in the recent past, Nassimbeni uses precise drafting lines to convey the architectural structures as they were initially conceived. He combines these marks with “thick, organic, broken lines to represent the contemporary wear and tear in the area” (Nassimbeni). For the artist, this complex approach to line is necessary in order to give an honest and visceral portrayal of the social politics inherent to his study. “When tracing my photographs of the buildings, I drew clean lines to reference the pristine state of the structures and the better standards of living in the recent past. I then re-traced the same images in free-hand and digitally enhanced the lines so they became jagged and grainy. In the prints, I layer these contrasting qualities of line, which outline the same structures, to give an abstract rendering of distinctly different times and conditions concentrated in a single area of the bustling city” – Nassimbeni. For further information and to view more artworks, please visit Lorenzo Nassimbeni’s artist page.